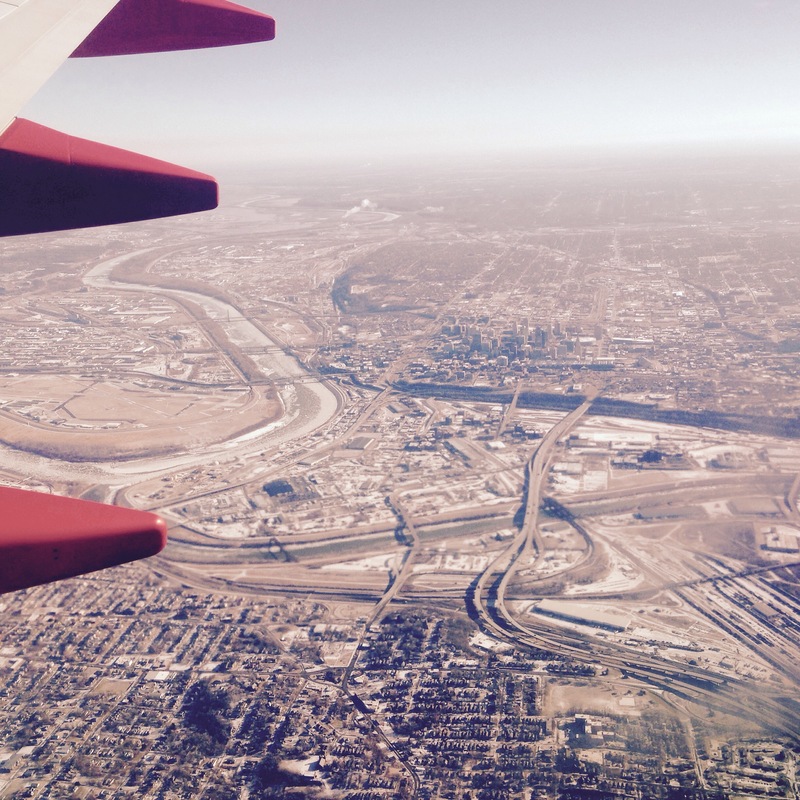 The 2015 racing season has officially started, with the first race in the outskirts of Columbus, OH. In 2015 I’m back to more original JTP paint colors. For CRCRC, my friend Ron hooked it up with these amazing looking bodies. Racing all four Modified classes, it was a busy week. Practice was Wednesday and Thursday, with a seeding run Thursday evening. Seeding taking your fastest 3 consecutive laps, I ended up 3rd in 2wd, 2nd in Truck, 2nd in SC, and 1st in 4wd. Qualifying started off with 2wd being up first. My car felt great all through practice and I had a good run to take the Q1 TQ. 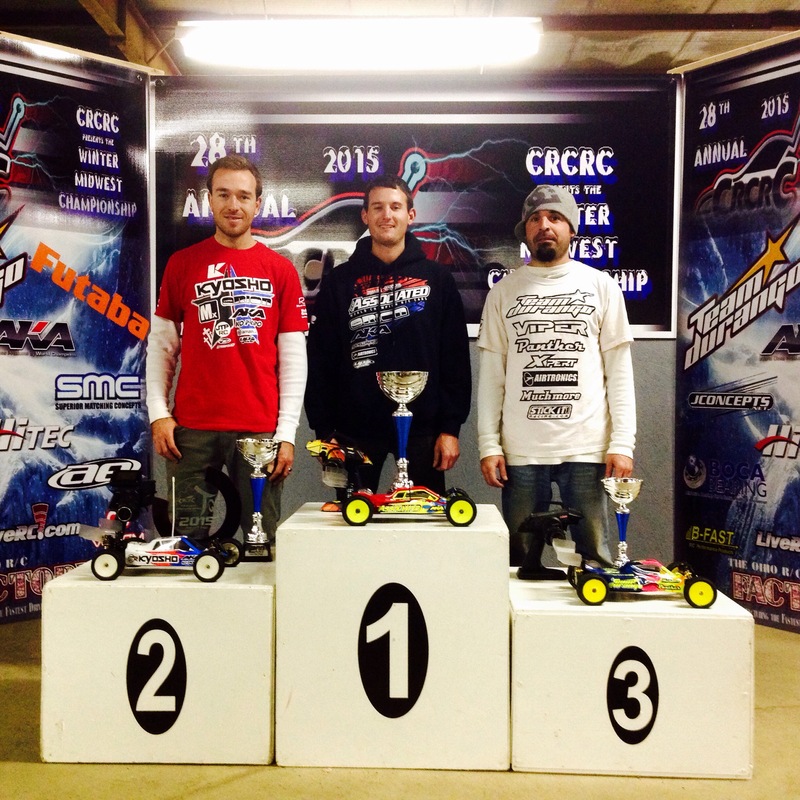 I also had good runs to grab the Q1 TQ in SC and 4wd, and got a 2nd in Truck, behind Cav. Q2 started off great again with a TQ in 2wd, and SC, and another 2nd in Truck. I’ve had the speed to TQ in truck, but I had a wcrash in the wall ride section in both qualifiers. In 4wd I crashed a few times and got 7th. The final day of qualifying was here, and I was ready. I really wanted to get all 4 TQ’s, and I felt I could, with all my cars driving so well. 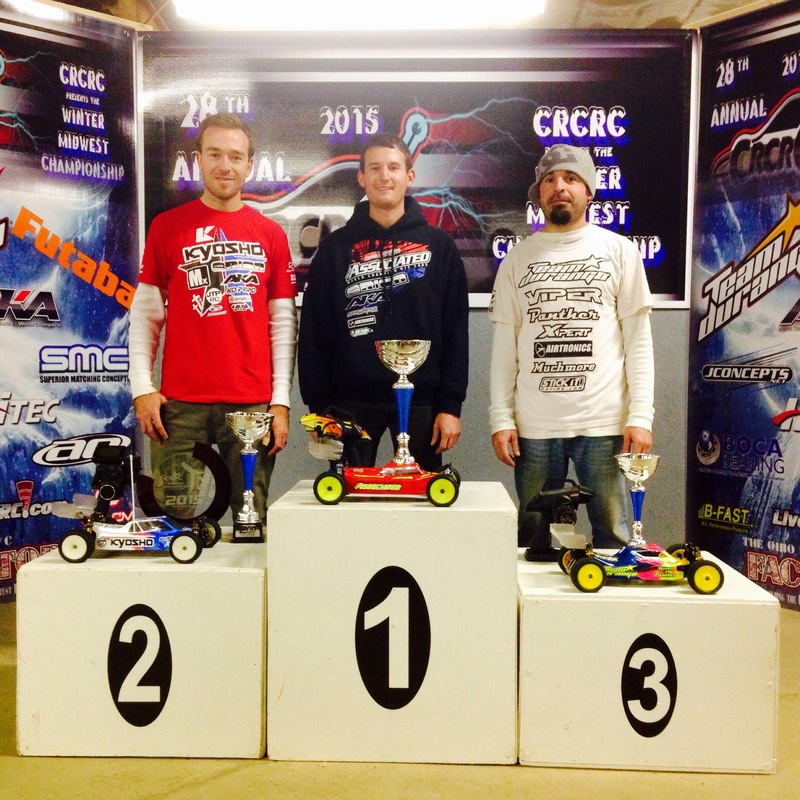 Q3 started off again with a TQ in 2wd, so that locked up the overall TQ spot. Next was truck, and I knew I had the speed to take it. I finally had my clean run, and took the TQ for Q3, and set the fastest time so far in qualifying. 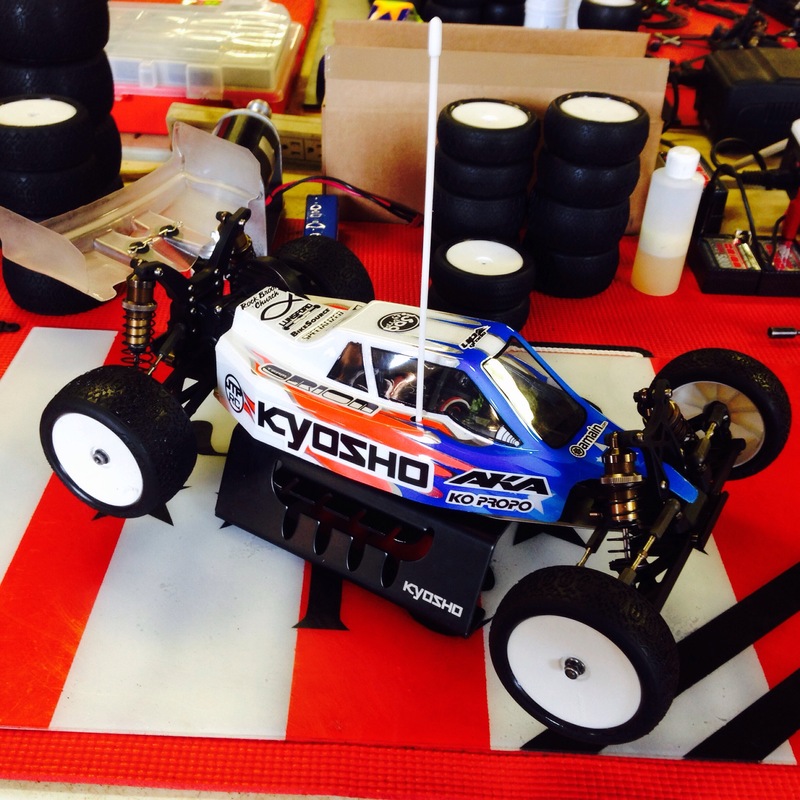 I also took the TQ in SC to lock up the overall TQ, and then took another TQ in 4wd. In Q4, I had 2wd, and SC locked up with three TQ’s, my two TQ’s in 4wd were quite a bit faster than Cav’s TQ time in 4wd, so that was basically locked up too. I needed a TQ in truck and to have a similar time as I did in Q3. My truck felt great again and I had a clean run to take the Q4 TQ and the overall TQ. Saturday night is SX night at CRCRC. Every year quite a few racers meet in the hotel lobby to watch the 2nd round of FIM/AMA Supercross. The racing was awesome and it was a good time. 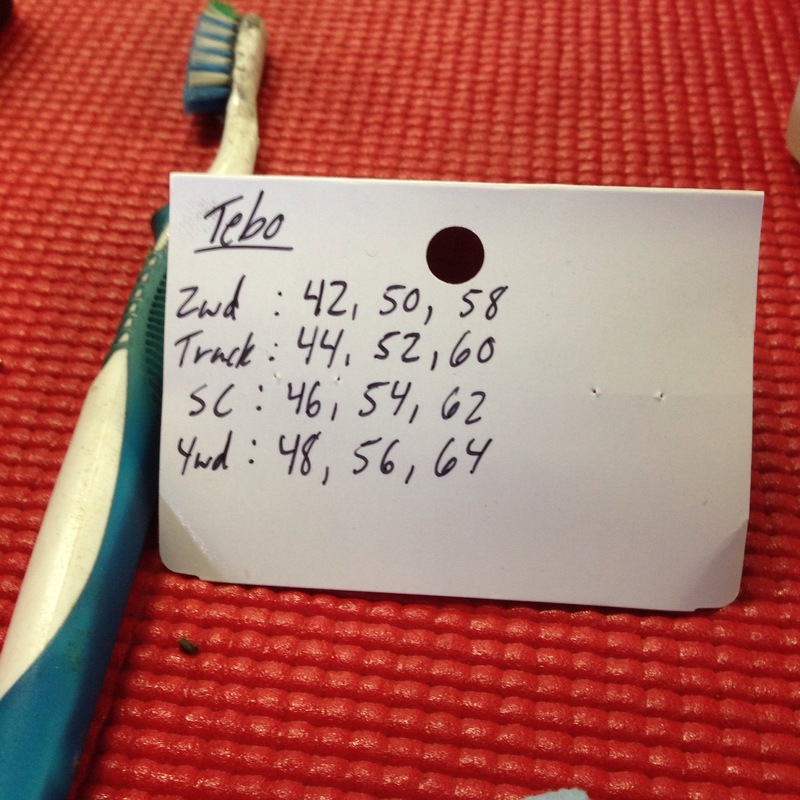 Sunday was race day, I slept good and felt rested and ready to take the full sweep. They did bump ups and then triple A mains, so the race schedule was a mess. The roof was raining pretty bad on main day, it hasn’t been an issue all week until now. There were wet spots all over the track and it felt more like a mario kart race, not a RC race. 2wd. A1 was a great race for me. Got a good start and was able to be clean and safe the whole race to take an easy win. A2 was not like A1 at all. I got a great jump and my car felt amazing. I pulled a good lead on the first 3/4 lap, but I jumped in too tight on the step up before the loop, clipped the pipe and crashed. I went from 1st to 12th. I was still confident I could come back, but on lap two, I made an inside pass on a car, but he just turned down on me and I crashed. The bummer is my rear shock spring cup came off my car in the crash, so my main was over. A3 I was very confident to get the win and the overall. Again I got a good start and was just wanting to be safe. I lead for the first half, then I flipped at the end of the straight, dropping to 2nd. Me and Ryan fought hard and swapped spots a couple times. On the last lap, Ryan got loose coming off the wall ride, I brushed into him, but passed him. I then hit a wet spot going up the triple and my car went totally sideways up the jump and I flew off the track. Ryan passed me back and he took the win. 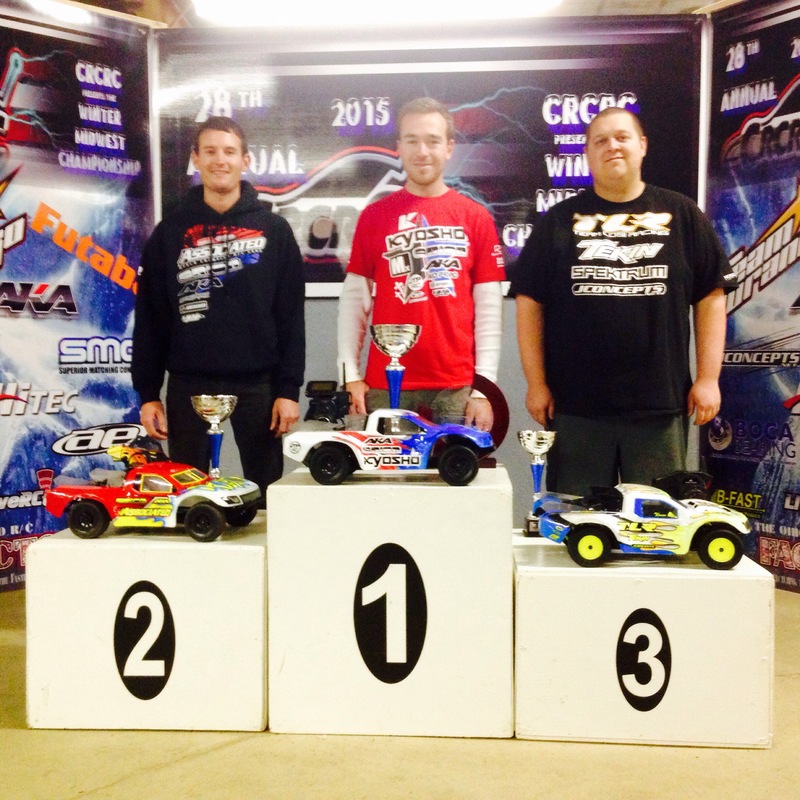 It was very disappointing to end 2wd that way and to not turn the TQ into a win. 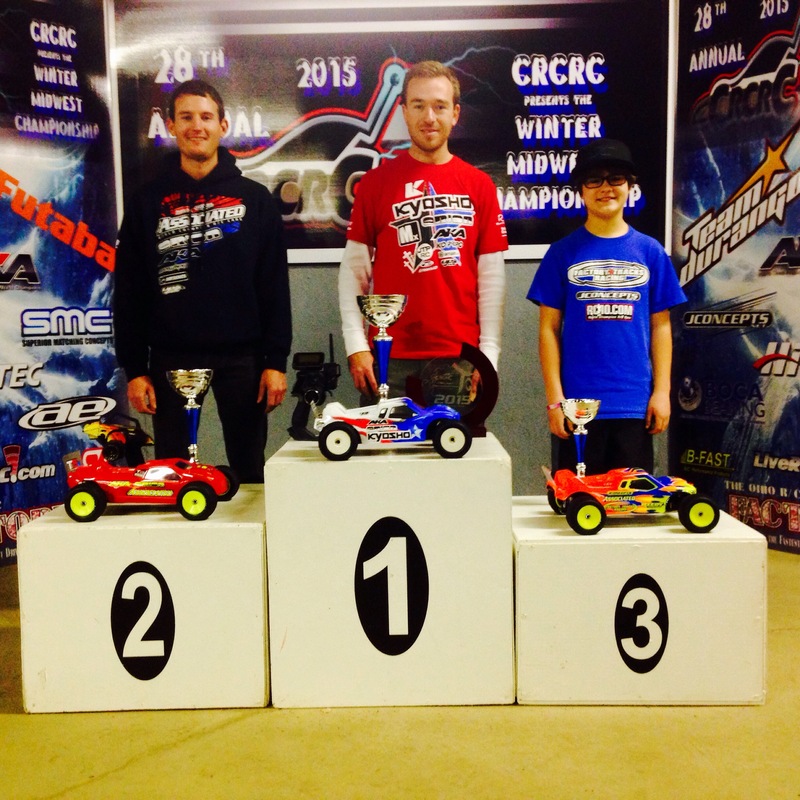 A3 was a pretty boring race as Ryan won the first two mains, so he didn’t race the third. With my DNF in A2, I still needed a good run. I had a pretty good main, trying to drive safe and smart and took the win. I was really happy with my RB6 and my speed was the fastest all week, it was just racing in the mains, and it didn’t fall my way. Truck. A1 was going great, very similar to A1 of 2wd. My truck felt amazing and I drove really smart in all the wet areas and pulled a 8 second lead. With about 1.5 minutes left I clipped the turn coming onto the straight and crashed. There were cars behind me, so the marshal waited for them all to pass. It was a very long crash and I lost my entire 8 second lead, and I even lost the lead. I closed back up to Ryan pretty easily, but I knew passing would be tough. I was pressuring him really hard, the on the second to last lap, he went a truck width wide after the table top jump, I shot to the inside and we went side by side around the sweeper, and I made the pass. I sprinted the last lap to get a small gap and took the win. That win felt great. A2 was a really smooth race. Got a good start, stayed out of all the wet spots, built a huge lead, and this time I didn’t make that big mistake. I took the A2 win by a huge margin and got the overall win. Felt great because I’ve fought my setup with my RT6 in MM and it felt perfect this weekend. SC. With the terrible track conditions, SC was tough to go around. I knew I just needed to drive smart and super smooth. A1 I started off great and just started to pull away. Ryan was really struggling with the water spots and the back triple. I drove a great race and finished with a huge lead to take the win. A2 was similar, except after a few laps, I built a good lead, but then I hit a water spot before the center triple section and my truck went flying into the infield. It was a long crash and I dropped back to 3rd. I moved into 2nd pretty quick and then reeled in Max who was leading. He was driving a great race, but then the water spots on the back triple got him and I got by and just checked out. I got the A2 win and the overall. This one felt good too, just like truck, I have struggled getting my SC feeling really comfortable in MM. I made very similar changes that I did on my RT6 and my SC6 felt perfect. 4wd. I really wasn’t sure how 4wd would be in the mains. The track was sketchy, the races were 7 minutes, and the center triple was pretty tough. A1 was a pretty good race. The track is really fast in 4wd and the speed difference was huge, even in the A main. We were catching tons of traffic and just flying around the track. We swapped the lead back and forth a few times with mistakes, but it was close at the end. I was putting in a hard charge on the last lap, but I hit a water spot on the roller before the wall ride, and that was it. I took 2nd behind Ryan. A2 I needed to win to make it go to A3. I had a good start and my car felt amazing. I pulled a small gap, but then a few minutes in, I got a weird bounce before the step up and crashed. I got back right behind Ryan and the race was on. I was faster, but I couldn’t pass, then he hit water before the back triple, but I landed on him and I got the worst of it. I reeled him back in and there was two minutes left. I got another weird bounce before the step up and jumped inside the pipe. I couldn’t get back onto the track and then ended up piled with a ton of lapped cars. From being off the track, all four tires had water on them too, so I crashed three more times that lap. I went from fighting for the lead, to half a lap down and in 3rd. I moved back into 2nd, but Ryan was gone. Ryan took the overall. A3 was a clean race and I took a very easy win to lock up 2nd. Just like 2wd, I was the faster driver, but made a few mistakes and had some racing things happen, and didn’t get it done to take the win. I couldn’t have been happier with my ZX6 as it drove perfect. All in all, it was a great weekend. It is nice to see my hard work pay off. Yeah it would have been nice to get the full weekend sweep, that was the goal, but I’ll take what I got. I came out swinging, was fast in practice, charged hard and drove aggressive in qualifying, and drove well in the mains. Also my cars all drove really good, I feel my setups are on par for 2015. The race was fun, track was a little disappointing layout wise, and the track conditions on Sunday weren’t very fun, but everyone had to race on the same track. 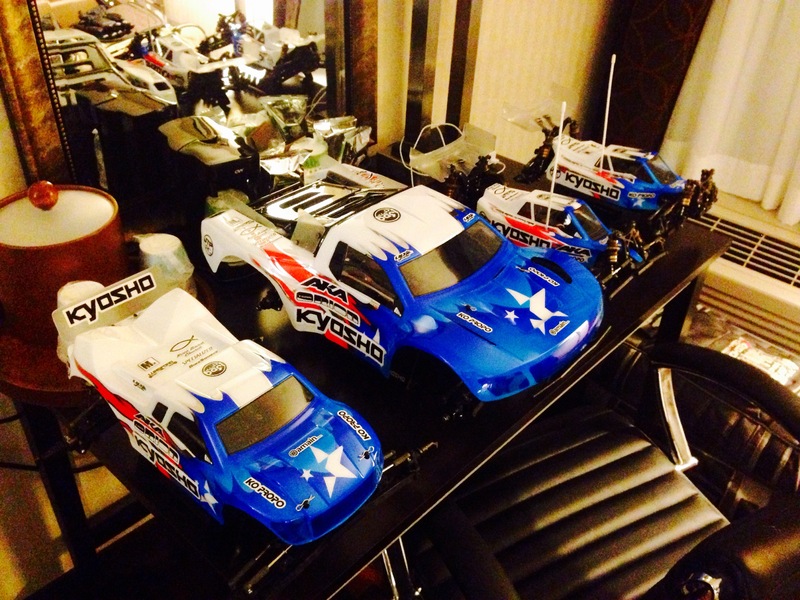 The Kyosho team was a blast to hang out with and we all really had a great time together. The CRCRC crew did a great job, 450 + entries and running the program really smooth. I’m already looking forward to next year and going for the full sweep again. 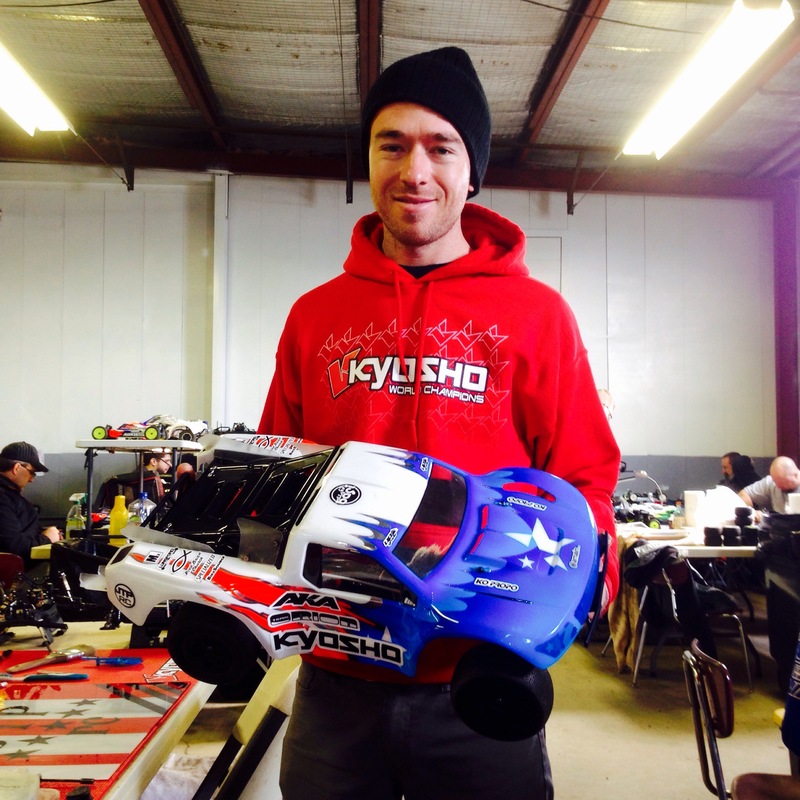 Thanks to all my great sponsors, Kyosho, Team Orion, AKA, Ko Propo, Mx, JTP RC, Amain.com, Upgrade-RC, Lunsford, MIP, LiveRC.com, Specialized Bicycles, Bike Source, Rock Brook Church, thanks to Joe Pillars for all the hard work this weekend, Zack Rogers for all the marshal help on Sunday, my amazing family at home supporting me always, thanks to all my fans for the positive support, and most of all, thanks to my Lord and Savior Jesus Christ for my racing career. See you guys in a weeks time out in Cali for the Reedy Race of Champions. Great job this past weekend. 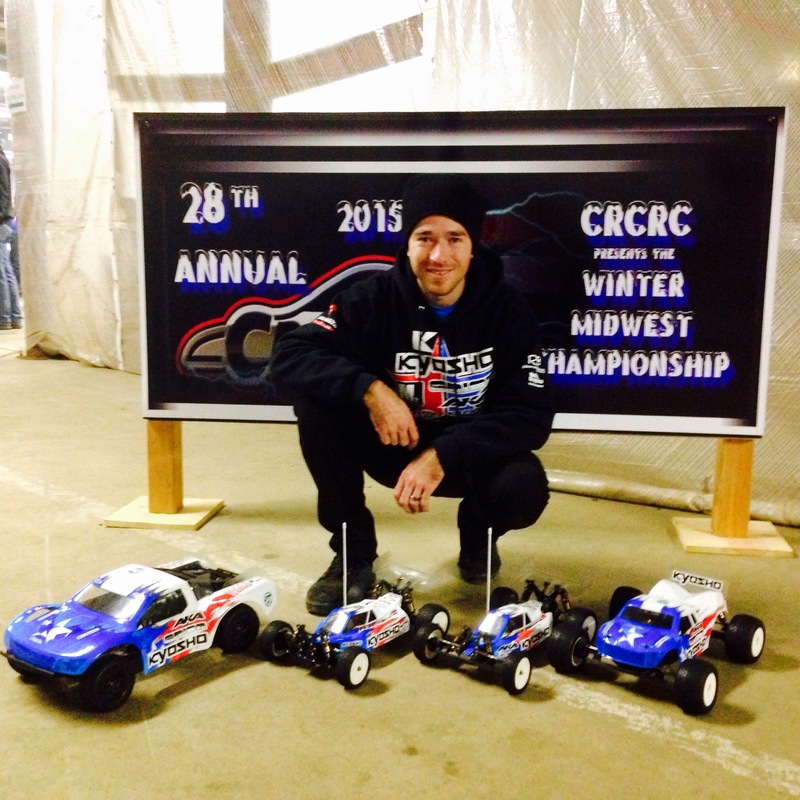 Would surely like to see the setups for the 2015 CRCRC as I run all four of those vehicles. Jared first off congrats your cars looked amazing this weekend all the prep and setup work payed off. i have a couple questions are you using the new alum steering post bracket? also i saw you had a couple different bottles of traction compound in your pit what compound have you mostly been using lately? Thanks. No i didnt use the new steering part. I used yellow cap liquid wrench the whole time. I also was wondering on your sc6 if you have tried using the 2 hole pistons?and what your thoughts were? I have before, i like the 5 hole pistons better. The 2 hole seems to make the trucks too reactive. Jared great job this weekend! I was pullung for u the whole time. Can’t wait to see the setups! What was the tire compounds that you used? Was it clays most of the weekend? I’m going next year.